Today my favorite furniture company turns FIVE! Five years ago was the summer we moved to Charleston, and this was right before Pinterest and Instagram became the mainstream avenues to let us all know what was "in". Luckily, my friend Roxy was ahead of the game and was ready to make bar carts a household staple without even needing social media. She founded Society Social and brought back the bar cart trend with finesse and flair! 5 years later her furniture company Society Social still wows and inspires the world of home decor. Jonathan and I are honored to be amongst Roxy's customers a.k.a. #therealsocietysocials. See more of our home feature with our Quinn sofa and Madison Mixer bar cart, which to this day is my favorite piece in our home! Also enjoy this round-up of photos featuring my bar cart in various shoots with Rachel Red Photography! Cheers to a great first 5 years for my pal Roxy, queen of the modern day bar cart! *Co-styling at Candy Shop Vintage with Kelly from Paper Meets Pearl, Florals by Flowershop, Pillows by Ibu. If there’s one thing that I love doing it’s hosting a party! Home cocktail parties are a great way to bring your friends together in a warm, loving environment and have a blast! But, if you're like me, you get a little overwhelmed at the thought of playing hostess all night. 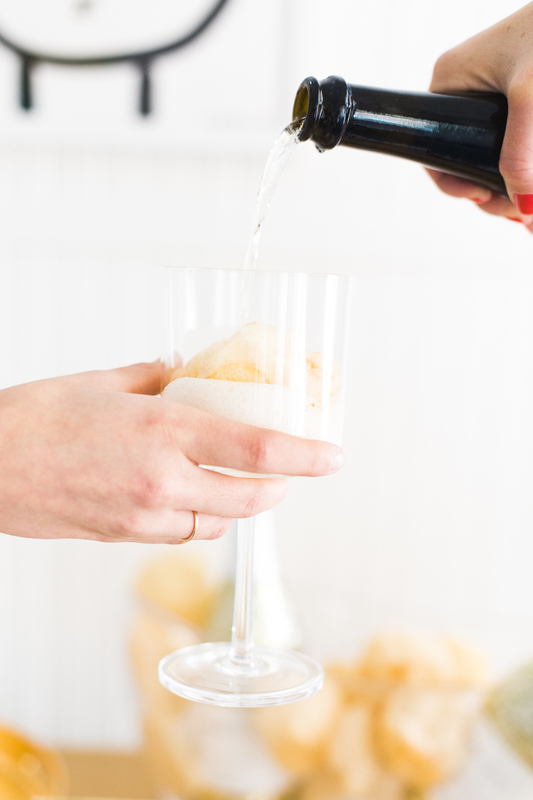 Today, Kelly @ Paper Meets Pearl and I are bringing you some tips to effortlessly host a fabulous celebration & make everything run smoothly so you get to enjoy your own soiree. Whether you own a bar cart or not, you can make hostessing easier on yourself by setting up a bar area. Set things up well, and your refreshments can serve themselves! We set out all of our cocktail ingredients and added some cute calligraphy signs to encourage our guests to help themselves (which doubles as decor). Make sure you’ve got spare specialiy ingredients stashed on your cart, & display your extra bubbly to save yourself from making trips back to the kitchen all night. Just because you’re throwing a party doesn’t mean you need to run out and buy a million new things. If you have any antique milk glass pieces lying around, spray paint them the same color to make a great collection to display on your bar cart. 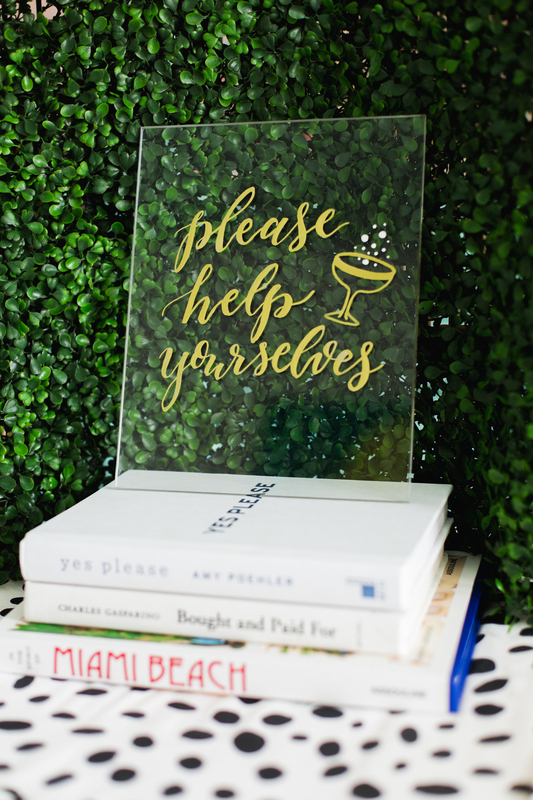 Use your cutest cocktail glasses to hold your bar tools and stack hardback books (with the jackets removed) to display your signs! Anchor your main gathering area with your favorite rug and it will define the space in the most delightful way. Flowers; the best way to spruce up your place, but they sure can get pricey! Stick to one or two blooms, then opt for lots of greenery! Think palm leaves, eucalyptus, and even fern leaves like we used here. What an easy way to add pops of color to your party. The best part of primarily using greens is that you can save some green (which is a dead ringer in our party handbook)! This concoction will make your guests think you went all out while still keeping things effortless! Instead of serving just basic bubbly or wine, this cocktail is only 3-ingredients but will definitely make your friends feel special. To make it even better, we used One Hope brut for the following reasons: A) 1 glitter bottle gives 15 meals to hungry children B) it's a delicious and light with a hint of sweet C) did you say glitter bottle?! 1. Place the cotton candy into a coupe. 2. Add a splash of elderflower simple syrup. 3. Top with bubbly, and watch your cocktail mix itself! The cotton candy mixes itself to a gorgeous gold color that is a sight to behold! We guarantee that your guests will rave about this magical cocktail. 5. Throw on Your Best Hostess Frock! Throwing on our favorite party get-up is one of our favorite parts of preparing for a soiree! Even if you’re just having some girlfriends over for no particular reason, simply putting on a fancy dress makes everyone feel more festive! Our dresses were under $100 from Dandy Boutique, and paired well with our Charleston Rice Beads!